It was Pax Interruptus 2002 (and I did look this up in the order of precedence since I mistakenly keep saying it was 14 years ago). James II and Elina II were sitting the Sylvan Thrones. Baroness Katryne of Bakestonden and I were having a conversation outside the hall, trying to justify ditching court. Since we were both Court Baronesses, we finally decided that we would be setting a bad example and snuck into the back. None too soon either, for I was called before Their Majesties. Queen Elina started talking to me about how I had promised her that I would make some clothing, and that she had now made a decision as to what she wanted me to make. I was surprised and astonished, for I did not feel that this needed to be discussed in court. It really was nobody’s business other than hers and mine. Then she pulled out this bolt of white fabric with Laurel Wreath all over it, and all I am thinking is: “But Your Majesty what are you doing, You are not a Laurel, I cannot make a Laurel dress for you, the Order will be so angry!” No, I did not say it, but these are the words that went thru my head. They are truly burnt into my memory. At this point Master Edmund Tregelles, the herald, called in the Order of the Laurel. It still did not hit me until Her Majesty said “I want you to make a dress with this fabric to wear for your vigil.” It slowly started sinking in. “But I am not worthy. I am not ready for this. I cannot accept this. I am not good enough.” Those were my thoughts as I was being escorted from court. In the back of court all the Laurels congratulated me and told me they would see me at Pennsic for the elevation. “But I do not know if I can accept this,” I kept saying. 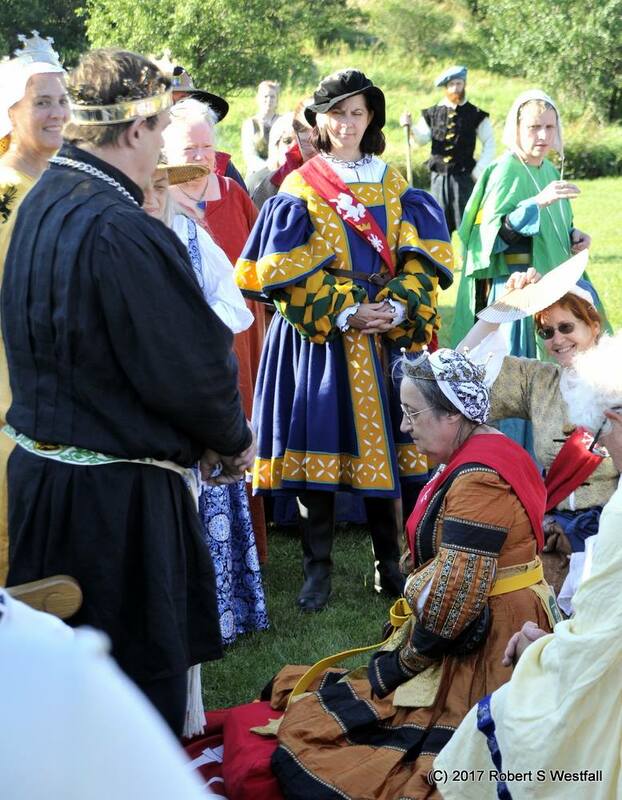 Mistress Alison of the Many Isles was asking me if I would accept her help with my ceremony along with my peer? I was belted to Mistress Rose Marian of Edgewater, a Pelican. And I kept saying “I do not know if I will accept this.” Yes, I put those two peers through hell. I came from Drachenwald where at that time writs were unknown. You were called into court in the morning, sent to vigil and elevated the same afternoon or evening. Your friends and peers had been notified and they had everything ready for you. I did not realize I had the right to have input into my ceremony, so needless to say I concentrated on whether or not I would accept the accolade, and my oath of fealty. Everything else I left up to the two peers. Yes, I did say I would make my own dress and that I would want other artisans to shine for my ceremony. I finally said who I wanted for my worthies IF I accepted and that remained if for a long time. I made the two Ladies plan a vigil and a ceremony without knowing if I would say yes or no! Much later I realized how horrible I was. While they were jumping through all kinds of hoops for me I was trying to decide whether or not to accept. I wrote to friends back in Drachenwald for advice. And I started planning, embroidering and sewing the dress I would wear IF I were to accept. Many sleepless nights followed and I just could not decide: Am I worthy? Am I good enough to be a Laurel? Am I ready to accept the responsibility of being a Peer. What IS a Peer? What IS expected of me? I received a lot of good advice and quite a few dressings down for my unwillingness to decide from my friends back in the old Kingdom. It was getting closer and closer to Pennsic. My dress of course was a Cranach German in my colors, red with gold bands and my SCA history and arms embroidered into the bands and guards, including household affiliations and awards. No, there was no Laurel wreath because for one I was not yet elevated and for two I still had not decided. I am sure the two peers were thinking I was a brat and actually not worthy to be elevated! The decision however I made was: I will finish the dress which other than the embroidery design was an exact replica of a Cranach painting – down to the beading design on the Brustfleck (the decorated band between the two fronts) – and I will show this dress to a mundane artisan friend who will be the judge. If my dress was museum worthy then I was ready to be a Laurel, if not than I would have to improve my skill, and could accept the award. Today I know that this last paragraph shows I really did not fully comprehend what it means to be a Peer. It is not just skill; it is also those elusive hard to define Peerlike qualities that make a Peer and I do not think that anyone can understand what they are until they have been a Peer, and even then they are really really hard to define. It has to do with the responsibilities we take on. The Leadership role we accept when becoming a Peer, trying to always be gracious and encouraging, and critical without hurting feelings. The inspiring without taking over, the knowing when to step back and let others take over, the letting non-Peers make mistakes to learn from and helping to guide them in fixing said mistakes, the gentle guidance and helping newcomers and oldtimers on their way to the goals they set for themselves, and many more things that I cannot even start to name. I did present my dress to our friend along with the picture of the painting I used as my inspiration. And our friend says: “Elisabeth I am disappointed in you!” My heart dropped, because I really had gotten used to the idea of being a Mistress of the Laurel, I just needed that final stamp of approval that did not seem to be coming. He went on with: “I really expected more from you! Where is your creativity? This is an exact copy, it could be in a museum as a dress from the 1500s Anyone can do that! I expected you to create a new design something spectacular, not a copy!” I started laughing, which upset him and then I explained the whole thing. And he told me of course you must accept the accolade. And you must teach, but do not forget about the Creativity. Thus, my decision was made and I let the two Peers know. Fast Forward to Pax Interruptus 2017. Again, I am called into court. Again, I am surprised with a writ. Again, I am escorted by an Order out of the court. This time I know a little bit more what is expected and what I am allowed to do. And no I will not put my peer Mistress Ysabeau Tiercelin and others through the “will she accept or not” hell. Yes, I will accept the accolade. This time I hope I know what is expected of a Peer. I have been one for 15 years. However I have a request to all SCAdians who know me or know of me. I would like to hear from you. I would like a report card as to what I did well as a Peer the last 15 years but even more importantly, what I can improve. The date of my elevation will not be until the fall. But I hope that many of you will seek me out in person when you see me or by email (bostonhahn at aol dot com) or whichever way you feel comfortable counseling me. Because I would really like to use the time from now until my elevation to contemplate on what I can improve. For I am here to serve to the best of my ability. And yes, I know I am blunt and straight-forward and at times intimidating. Please believe me, I am working on that, but it is hard to teach an old dog a new trick. I hope my story gives you a little insight into what happens after the writ and I look forward to hearing from all of you!